This 72" wide French Country Buffet Sideboard is sure to bring a classic French Country style into your dining room or kitchen. Order this as shown in a brown maple wood with a stunning painted and distressed finish for a true country feel. You can also choose from our many wood and finish options to create your own special look for your dining room. We are happy to send out finish samples to help you decide on the perfect wood and finish for your new Amish furniture. This buffet has plenty of space to store all of your dining essential inside plus there are two hidden drawers. 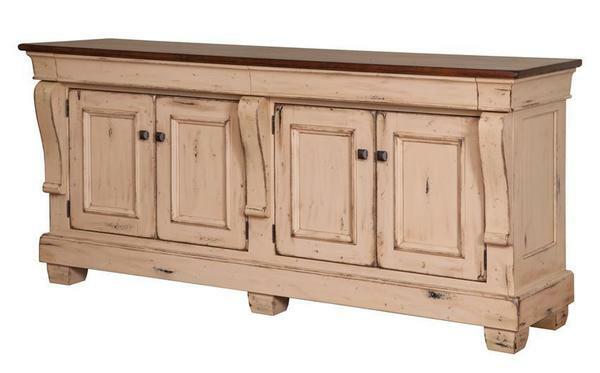 Call today to bring some French Country romance into your home with this new buffet. You can also visit our Amish furniture store in Sarasota, Florida.